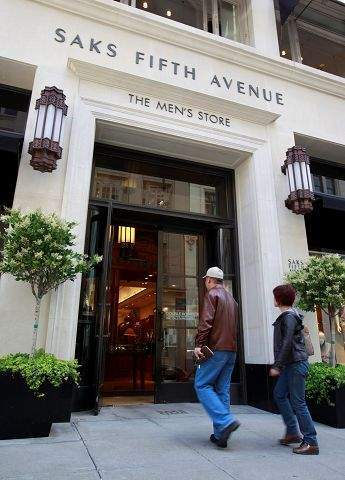 Customers enter a Saks Fifth Avenue store May 4 in San Francisco. Economists say consumer spending has slowed mainly because the richest 5 percent of Americans  those earning more than $207,000  have cut back. They account for about 14 percent of overall spending. WASHINGTON  Wealthy Americans arent spending so freely anymore. And the rest of us are feeling the squeeze. The question is whether the rich will cut back so much as to tip the economy back into recession  or if they will spend at least enough to sustain the recovery. The answer may not be clear for months. But their cutbacks help explain why the rebound could be stalling. The economy grew at just a 2.4 percent rate in the April-June quarter, the government said Friday, much slower than the 3.7 percent rate for the first quarter. Economists say overall consumer spending has slowed mainly because the richest 5 percent of Americans  those earning at least $207,000  are buying less. They account for about 14 percent of total spending. These shoppers have retrenched as their investment values have sunk and home values have languished. In addition, the most sweeping tax cuts in a generation are due to expire in January, and lawmakers are divided about whether the government can afford to make any of them permanent as the federal budget deficit continues to balloon. President Barack Obama wants to allow the top rates to increase next year for individuals making more than $200,000 and couples making more than $250,000. The wealthy may be keeping some money on the sidelines because of uncertainty about whether they soon will face higher taxes. The Standard & Poors 500 stock index has tumbled 9.5 percent since its high-water mark in late April. Home values fell 3.2 percent in the first quarter, according to the Standard & Poors/Case-Shiller 20-city home price index. Think of the wealthy as the main engine of the economy: When they buy more, the economy hums. When they cut back, it sputters. The rest of us mainly go along for the ride. Earlier this year, gains in stock portfolios had boosted household wealth. And the rich responded by spending freely. That raised hopes the recovery would strengthen. No longer. The dizzying plunge on Wall Street in May and lingering stock market turbulence have shrunk Americans wealth. The Dow fell 10 percent for the April-June quarter. The broader Standard & Poors 500 index dropped 11.9 percent. And the rich once again are more cautious about spending, economists say. The affluent went back to tightening their belts in June after months of vigorous showing. Data from MasterCard Advisors SpendingPulse showed luxury spending fell in June for the first time since November. The decline followed a solid rise in sales revenue earlier in the spring. It isnt a good omen for the consumer recovery, which cannot exist without the luxury spender, said Mike Niemira, chief economist at the International Council of Shopping Centers. At the same time, government reports show shoppers as a whole cut back on their spending in both May and June. Companies have responded by refusing to step up hiring. The housing market is stalling. And Americans are seeing little or no pay raises. It adds up to a recipe for a grinding recovery to slow further. And it helps explain why economists expect the rebound to lose momentum in the second half of the year. Especially if the rich dont resume bigger spending. Thats because whether theyre saving or spending, the wealthy deliver an outsize impact on the economy. Whats not clear is whether they will remain too nervous to spend freely again for many months. Thats what happened when the recession hit in December 2007 and then when the financial crisis ignited in September 2008. As their stock holdings and home values sank, the affluent lost wealth. Their jobs werent safe, either. Bankers, lawyers, accountants and mortgage brokers were among those getting pink-slipped. Those who did have jobs feared losing them. Neither group spent much. Instead, Americans savings rate spiked. And most of the increase came from the richest 5 percent, according to research by Moodys Analytics. In the first quarter of this year, stocks rebounded, layoffs slowed and the rich were spending again. But now the rich are building up their savings and splurging less on discretionary items. Thats starting to show up in softer sales at upscale retailers, such as Neiman Marcus and Saks Inc. Its because people like Angeli Gianchandani, 40, have cut back. She used to hit the mall every two weeks  flicking through the racks at Saks or Bloomingdales and returning home with a new frock. Not anymore. Shes limiting her splurges now. The downturn in the stock market has played a role. Rather than spending more money, Im keeping more, says Gianchandani, who lives in New Jersey. Even with recent losses, household net worth has risen 13 percent from its bottom during the recession. Net worth  the value of assets like homes, checking accounts and investments minus debts such as mortgages and credit cards  grew 2.1 percent in the first quarter. However, net worth would have to grow 21 percent more to regain its prerecession peak. In the meantime, dont expect the wealthy to suddenly start spending lavishly. The affluent, as their wealth goes down, theyll become more and more conservative, predicts David Levy, chairman of the Jerome Levy Forecasting Center.